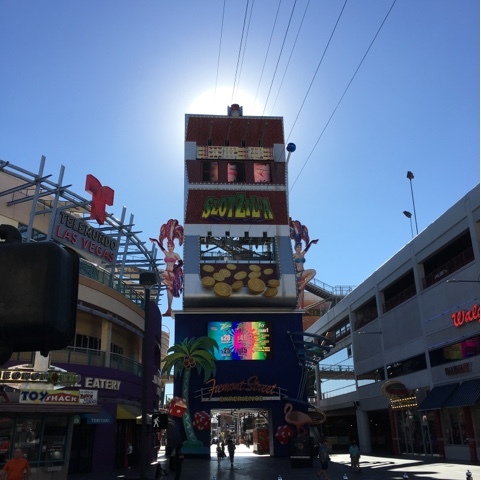 This past Vegas vacation, I stayed in downtown Las Vegas with my parents. 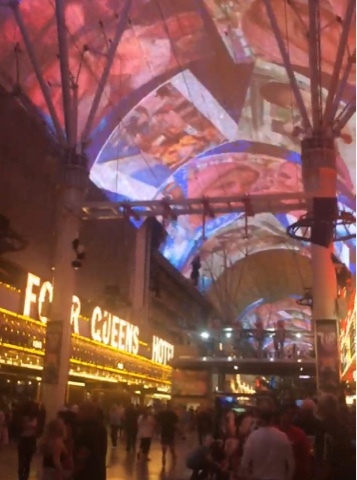 We frequently saw people zipping and zooming above us as we walked through the Fremont Street Experience. While I am too scared to do any ziplining in my home state of Hawaii, SlotZilla - a 12-story, slot machine-inspired zip line attraction - looked like something I could accomplish. SlotZilla offers two ways to fly. 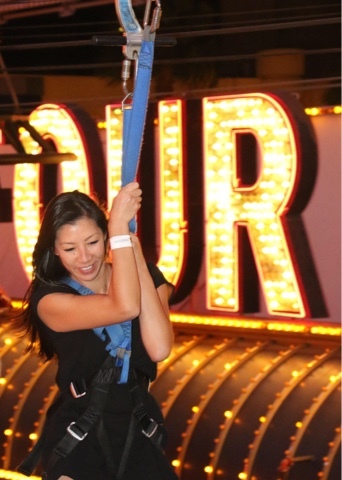 In the lower zipline, you zip in a seated position and start off 77 feet up. Flyers land halfway down the Fremont Street Experience pedestrian promenade (between the Four Queens and Fremont casinos). On the upper zoomline, you'll take off in Super Man form and from 114 feet up. Flyers will fly 1,750 feet to a landing platform at the historic Golden Gate casino. Our group wanted to fly on the upper zoomline, but it kept selling out so we decided to do the lower line. As you go through the line and wait your turn, you'll be suited up with the harness. I was a little anxious as I walked down the stairs and was suspended, but the exhilaration kicked in as we started ziplining. It was a thrill and the distance was just right for me. When you reach the end, the line jerks a bit and camera flashes will distract you as you are slowly pulled back on the platform. You'll most certainly laugh at the pictures they took of you and you can purchase them to enjoy forever. SlotZilla is open 1:00 p.m. to 1:00 a.m., Sunday through Thursday, and until 2:00 a.m. on Friday and Saturday. There are some height/weight requirements for riders. There I am on the right! My face is saying, get me on LAND!